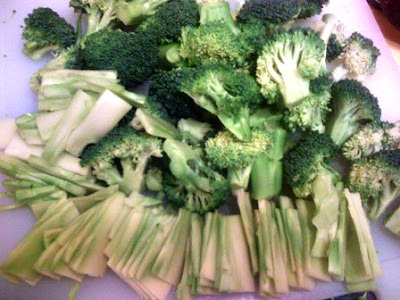 Different aromas waft from the kitchen while cooking beef broccoli. First, there's the garlic and onion, then the beef, and finally the sweet broccoli. Truly enticing. Best of all, it's easy to cook. 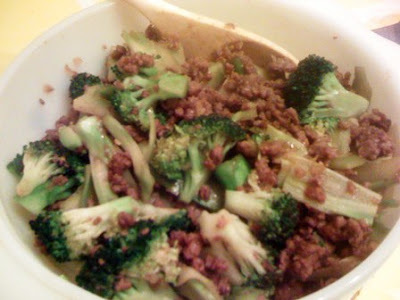 I also love my broccoli crunchy and half-cooked in this dish. 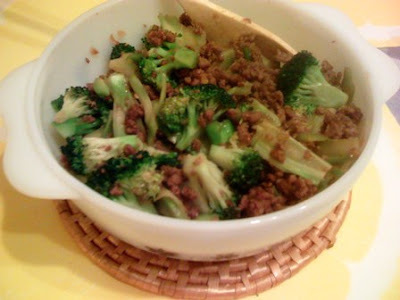 This version is rather different, in that we are using minced instead of sliced beef. This is so because minced beef is the only thing readily available :-). But it also worked rather nicely. 1. Pour cooking oil on pan over medium heat. 2. Saute garlic, followed by the onion. 3. 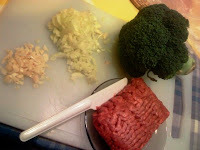 Add the minced beef. Mix it up and break up the meat to loosen the beef. A transformation will then happen to the meat. Its original reddish color with turn to brown. And then it will release its juice and cook in this water. Stir occasionally to make sure the beef on top gets cooked too. Then, it will release its own oil and will continue cooking on it. After a couple of minutes in cooking on its own oil, add salt and pepper to taste, followed by the oyster sauce and the water. Mix it up, taste, and adjust if needed. Then add the broccoli. Add also the capsicum at this stage, if you have this. Give it a couple of minutes just so the flavours blend. Serve and enjoy. Good for four people. Best with hot rice. Thank you for posting this. this is one of my favorite dish, but I dont know how to cook it. I hope my trial will be a success.